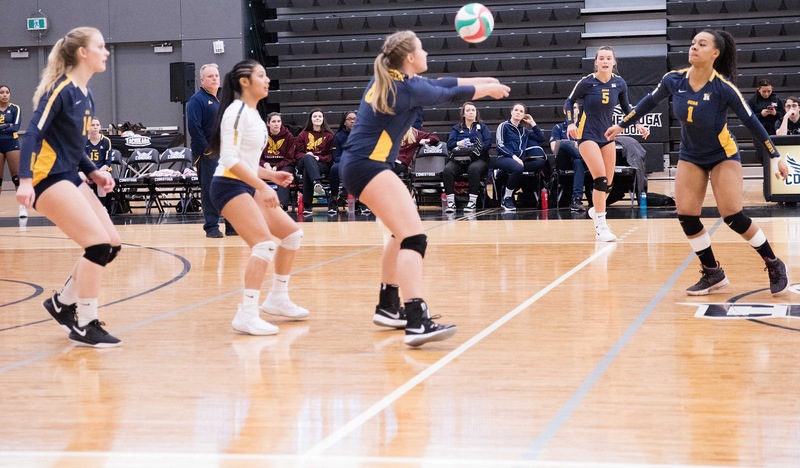 Both Humber’s men’s and women’s volleyball teams won their respective matches on Sunday afternoon against the Conestoga Condors. The women’s volleyball team defeated Conestoga with a 3-0 (25-15, 25-16, 25-19) win. The Hawks started out slow, but picked up the pace throughout the first set. They ended the first set with a game-high hitting percentage of .312. They won the second set with ease, forcing Conestoga to make multiple timeouts. Blocker Trinity Lougheed had multiple kills down the middle. Humber controlled the final set, although it consisted of numerous rallies that included tips and blocks. Danielle Miles and Julia Watson were the lead scorers with eight kills each. The Hawks had 49 digs, 12 more than Conestoga. Captain Kyla Wilkins is Humber’s all-time dig leader, and had six digs against the Condors. She now has 165 digs on the season, and 577 overall. The men’s volleyball team also defeated Conestoga, by way of 3-2 (23-25, 25-23, 19-25, 25-14, 15-7). Humber struggled in the first set as they made multiple serving errors, and head coach Wayne Wilkins called a timeout. Humber began to erase the deficit, forcing Conestoga to use two timeouts in the process. The second set was similar to the first, but the Hawks started to take control as Rafael Hilario and Kamyn Wilkins had two kills each that gave their team the lead. The third set wasn’t the best for Humber, as coach Wilkins called two timeouts and the team continued to give away points to the Condors coming off of unforced errors. They eventually lost the third set, 25-19. The forth set was a complete turnaround for the Hawks, with Hilario and Wilkins continuing to dominate with blocks and kills. The set ended in Humber’s favour, 25-14. Both teams gave their best effort in the fifth and final set, with Conestoga not being able to handle Humber’s continuous push. coming out on top. Minute long rallies kept the crowd fixated on what the result was going to be, as Humber came out on top. Humber’s hitting percentage was .274, they also had 41 digs, including nine from Kamyn Wilkins and eight from Rady Kim. Wesley Lau’s 19 points was not enough for Conestoga, while Rafael Hilario had 21 points for the Hawks. Both of Humber’s volleyball teams continue their seasons on Saturday when they host Boreal on Saturday evening, and Cambrian on Sunday afternoon. Featured image from Humber College.